Earlier this week I attended a book event at an odd sounding restaurant – Supermarket Art Bar. The place was overflowing with people. All gathered to participate in the launch of Canadian Voices, an anthology of prose and poetry by emerging Canadian writers. Published by BookLand Press, the book is the first of its kind in Canada. This is Volume One. Others will follow over the years. 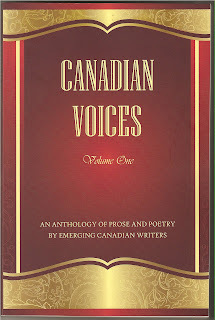 Publisher Rogert Morgan introduced the concept of the collection saying the idea was to encapsulate some of the best contemporary writings in Canada by emerging Canadian writers in a single volume. A quick look at the table of contents page showed a multicultural diversity the Morgan’s publishing company has put together into one book – it brings together nearly 50 prose writers and poets. Short story writer, poet and novelist Jasmine D’Costa introduced some of the writers who read their work. The launch was simulcasted on the web, too. Despite my tight schedule, I managed to read some stories and many poems from the book. The best way to read such anthologies is to randomly select a story and start reading it. The first story I read was Professor Z. W. Shen by Hailun Tang. It read like a memoir – a touching tale of a professor in China who despite persecution during the Cultural Revolution, fearlessly agrees to teach English to two students; one of them is the writer of the story, who ultimately immigrates to Canada. Then I read Pratap Reddy’s In the Dark, a story based on the power outage that North American experienced some years ago. Reddy skilfully turns the tables on the reader who expect something to happen between Anne and Dev, the two main characters who meet in the subway. The short length of the each of the stories makes for an easy read. on the tired road beneath my feet. For the first time ever, I promoted this blog directly. He looked at me bemusedly, and then smiled. Before I left for home, I went across to Jasmine D’Costa to get her to autograph the book. She did and so did writer Zohra Zoberi.